Since the leaves started falling here already, I jumped right into transitioning our decor for fall. I just love all of the warm and neutral colors that are associated with the subtle changes outdoors. Throughout the year, I keep the buffet in our dining room very simple. It is important to me to have a clean canvas for creating seasonal decor as we move through each month. When one holiday or season ends, we are onto the next! 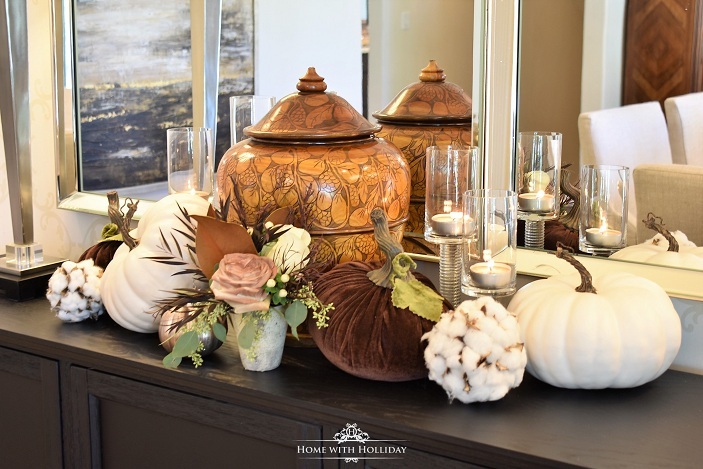 Today, I am giving you tips for Creating a Neutral Fall Vignette with Pumpkins like the one I created here. As I started pulling out our decor from last year, I knew I wanted to feature the brown velvet pumpkins I bought last season. I always love reusing and repurposing items but use them in a different way. You don’t always have to start over. Having a handle on the events and/or dinner parties we will be hosting this season, I decided to keep the decor very neutral. I choose to use whites to provide a nice contrast to the brown velvet pumpkins. Plus, I can add other colors or elements into the vignette later in the season. For example, if some of my future table settings or events include other colors, it is easy to pop in some flowers or other color-coordinated fall decorations to coordinate with new designs. This post contains affiliate links to help keep this blog up and running. In this case, I wanted this vignette to be quite large since my buffet (92″ long) was totally clear of accessories. If your space is smaller, you could certainly use a tray or platter to provide a base for something like this. I enjoy starting with a blank surface when possible. If you can’t, then work around pieces you already have. Fall is my favorite time of year to feature this incredible hand-carved Haitian urn given to me by my parents. It was gifted to them by some missionary friends from the U.S. to Haiti on the island of La Gonave. The lovely ladies spent decades on the island with no electricity or running water helping and ministering the local people of that island. I remember many visits from them as they would stay in our house during all of their visits back to the states. My fond memories of them are part of what makes this piece so special. It is likely that you won’t have a piece just like this, but you could easily use a white ginger jar, urn or any other decorative accessory. I will source some options for you below along with other fall decor you can use for creating a neutral fall vignette with pumpkins. I found these lovely white pumpkins at Hobby Lobby very inexpensively along with the cotton spheres (which are actually Christmas ornaments). They were so cute that I decided to also use them on my dining room table for a table setting I will be sharing very soon! You could certainly use any type or amount of candle holders to create this look. Here, I used clear glass candle holders since I was placing them in front of mirrors. I was hoping they would disappear a bit because of all of the glass. Plus, I love the look of glass on glass. For the flowers, I worked with my good friend, BJ Dyer and his team at Bouquets here in Denver. We collaborated to design a centerpiece and satellite arrangements for a table setting I put together last week (post on that coming soon!). They created this stunning little arrangement specifically for my buffet. For this piece, they included a Mondial Rose and a White Ohara Rose (hand-airbrushed!!). The filler included deep purple/burgundy Scabiosa, seeded Eucalyptus and Magnolia leaves. Isn’t this just stunning?! Wait until you see what they created for my table setting!! As I shopped for similar pieces to my hand-carved urn, I recalled this stunning piece by One Kings Lane. This porcelain Ginger Jar would be so perfect to create a similar look! Watch for this piece to show up in my home! Thank you for stopping by today to see these ideas for Creating a Neutral Fall Vignette with Pumpkins for yourself. Do you have any family pieces you like to incorporate into your fall decor? I would love to hear about it in the comments below! This vignette would also work great for an island, Butler’s Pantry, and even for a table setting. 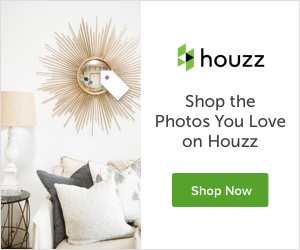 To see more inspirations for creating Vignettes or more ideas for Fall and Thanksgiving Table Settings and Home Decor, come by and visit my Pinterest page. Flower arrangements by Bouquets of Denver. love your elegant style!!! Thanks for sharing. Thank you so much, Wendy! I appreciate you stopping by! Have a great day!! I love how the Haitian urn took center stage and you seamlessly built around it! So, so classy! Thank you so much Corinne! They say that copy is the best form of flattery, so go for it girl! I bought the white pumpkins at Hobby Lobby and right now they are 40% off! Thank you for stopping by! THE WHOLE LOOK IS BEAUTIFUL. I MUST SAY I LOVE THOSE COTTON BALLS. I WONDER IF ONE COULD MAKE IT THEMSELVES? BEAUTIFUL LOOK FOR THE FALL. Hi Sandra! Thank you so much! I just flipped over the cotton balls when I found them. I am gonna use them on one of my Christmas trees for sure! Thank you for stopping by! Love your beautiful fall vignette! so much inspiration!